Submit referrals within your dashboard. There is no higher compliment than when our Subscribers recommend our service to others. 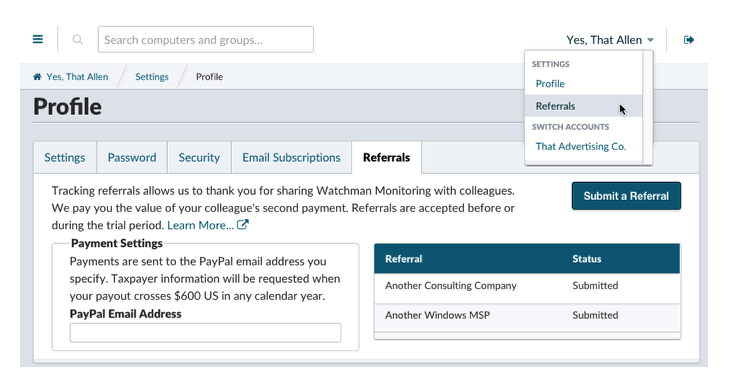 If you feel passionate about Watchman Monitoring and refer others to our service, we will pass on the new Subscriber's second monthly payment as a way to say "thank you". Referrals are counted when a new subscriber reports how they heard about their product, or when a referral partner reports a new lead. In either case, referrals should be reported before a new Subscriber completes their 30 day trial. What is the difference between a Referral or Affiliate partner? Referral partners submit occasional leads, and receive a one-time payment equal to their second month's fee as our thank you. Affiliate Partners commit to submitting five (5) active leads in any given twelve month period, and will receive an ongoing commission for as long as they remain active. Is everyone is a referral partner by default? Yes. All you need to do is tell other IT professionals how Watchman Monitoring benefits you, and encourage them to start a trial. What if I want to become an Affiliate, for ongoing commissions? If you feel strongly about our service, and expect to close more than five (5) leads in any twelve (12) month period, you encouraged to elect Affiliate status. Rather than one-time payments, you can receive an ongoing 10% commission for your leads, so as long as you remain active in the affiliate program. Affiliates who do not actively refer new subscribers will receive at least one years' commissions from each subscription. Who should I refer to Watchman Monitoring? Watchman Monitoring is targeted at IT Consulting companies who service businesses and/or home users, and are looking to provide even better care for their customers. Internal IT at larger corporations, and teams who support education are also likely to enjoy Watchman Monitoring in conjunction with their computer management systems such as Casper, FileWave, Lanrev, Munki, and the like. In-house IT firms are better suited to find a regional reseller in our Provider Locator. Can I get a code or link to give out? Must I be a current Subscriber of Watchman Monitoring? Referral and Affiliate partners are encouraged to actively use Watchman Monitoring. Reach out to support with any questions. Is there a limit to the number of referral payments a Subscriber can receive? No, you are welcome to refer Watchman Monitoring as often as you like. Payments will be sent via PayPal, in USD. All taxes and fees are the responsibility of the recipient.